Read them on your PC or e-book reader, or print them out. I offer several e-books (.pdfs) for free download from my website. They can all be read using the Adobe Reader either on-line or off-line if you save the file to your computer. Click on the .pdf link, the title of the book, to open the book in your computer's Adobe Reader, then save it to your PC. Or you can right-click on the title and select from the menu "Save Link as:" to save the .pdf book to the directory you choose. Be patient while the books load; some are a bit big, but once loaded you can move around the book quickly. If you don't already have the Reader installed on your computer (most new computers come with it installed), you can easily download and install the Reader yourself. If you need help, you can consult my Lessons. And don't worry. If you prefer to read ink on paper, you can print the e-books out on any PC printer. For more free e-books from other on-line sites, check out a list below that I've compiled of great sites. 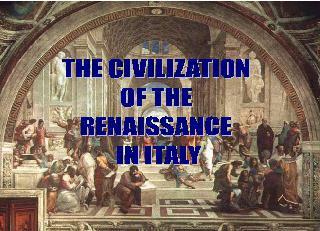 This is an English translation of the original Italian, 321 pages long. I've illustrated it with images relating to the text. It is a large file, but well worth the wait. You can read three chapters as pages on this site. I've formatted the pages so they fit on the Reader screen (landscape format), and have made the text large enough to read easily without needing to enlarge the page. It's ideal to read to a child, or for the child to read alone. Schools use it as a reader and English teaching tool. 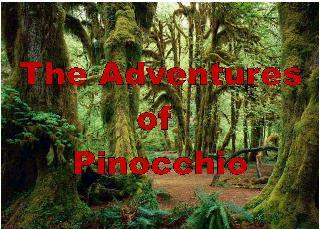 Find out more about Pinocchio on my Pinocchio Page. This classic gothic romance is 150 pages long. I've edited it and divided up the sometimes page-long paragraphs to make it more readable. 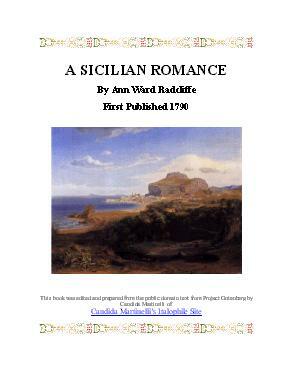 Mrs. Ann Ward Radcliffe (b.1764-d.1823), the English novelist, is considered the mother of Gothic Romance Novels, starring damsels in distress. Read more about her on my page about her and the book. The book is a fun read and should be read in a lighthearted manner. It resembles a fairytale, complete with wicked stepmother. Mrs. Radcliffe's books were so popular they attracted a parody or spoof by none other than Jane Austen with her wonderfully entertaining novel Northanger Abbey. This classic textbook is 228 pages long. The only thing omitted from the original book is the index, because you can search the e-book easily for any word using the e-book Reader. I’ve added a small piece about the author at the end of the book. I've illustrated the book with images to highlight various parts of the text. Landscape format with a large font. Open/Download Ancient Rome from the Earliest Times down to 476 A.D.
Plutarch's book is a series of 4 single biographies and 23 pairs of biographies of Greeks and Romans, originally written in Greek by Plutarch who lived from approximately 46 to 120 A.D. The book is a whopping 1719 pages. Most people offer the book in volumes, and for a price, but I've put it all in one free book so you can search it in it’s entirety with ease. 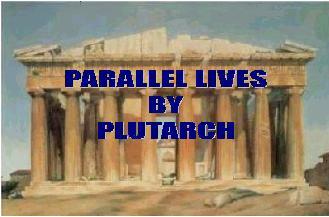 I’ve added a preface with an introduction to Plutarch and this book. Landscape format with a large font. This classic work from 1878 is 349 pages long, followed by two pieces I added about the author and his history writings. Landscape format with a large font. I've added appropriate graphics at the start of each chapter. The State as a Work of Art, The Development of the Individual, The Revival of Antiquity, The Discovery of the World and of Man, Society and Festivals, Morality and Religion. This is a charming book of 87 pages that transports you back in time, but shows you that very little to do with human nature, and certain professions, changes. Joseph Jefferson, Edwin Booth, Charlotte Cushman, Clara Morris, Sir Henry Irving, Henry Brodribb Irving, Ellen Terry, Richard Mansfield, Tomaso Salvini, and Adelaide Ristori. I've added images of the actors, and brief biographies to assist provide the reader with some background. 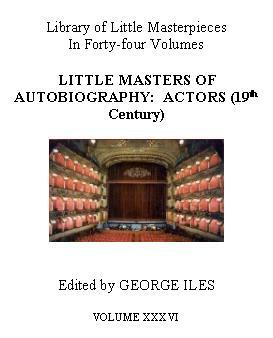 These are autobiographical snippets, that provide social history, and a history of the acting profession, including the highs and lows that remain the same to this day. I have it here on this site because Tomaso Salvini and Adelaide Ristori were two very famous Italian actors who created a world-wide reputation for themselves. For more about the book, excerpts, images of rooms with views, and to read the book on-line, visit my Room With A View Page. 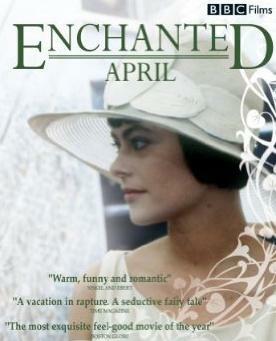 The novella (roughly 190 pages), and basis of the 1992 film of the same name, was The Enchanted April by Elizabeth von Arnim. It is an italophile favorite, just like the film and novella A Room with a View. A recent adaptation of her work was the film ‘Enchanted April’, from her novella ‘The Enchanted April’ published in 1922. It was made for British TV in 1991, directed by Mike Newell, then released in theaters in 1992. It was nominated for several awards and won many of them. It was then adapted to stage. It is the story of a woman worn down by her demanding, cold husband, and daily routine who escapes to a rented castle in Italy with an equally worn down girlfriend. They share the castle and gardens with two other women, both suffering from a lack of love, also. By the end of their fairytale-like month's vacation, all are engulfed in love of one sort or another. For more about the book, fun quotes from the book, and more about the authoress, visit my Enchanted April page. The University of Marburg in Germany once provided rough text transcriptions of three ancient Italian cookbooks. I've converted these texts into more useful indexed and edited PDF books that you can access and download. To read more about these books and what you might find in them, visit my page dedicated to them: Medieval/Renaissance Italian Cookbooks. 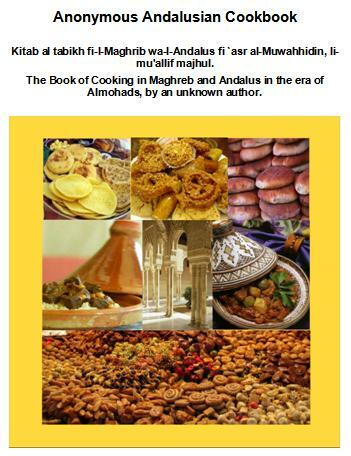 Al Andalus Cookbook, or An Anonymous Andalusian Cookbook, From the 1400s, copied from books from the 1200s, which were often copied from books as far back as 900. Roughly 200 pages. To read more about it, visit my page dedicated to it: An Anonymous Andalusian Cookbook. This book is on this Italian culture site because the cooking of Sicily and Italy was highly influenced by North African and Arab cuisine, as represented by the recipes in this book. Visit my Sicilian Food page if you would like to know more about this. 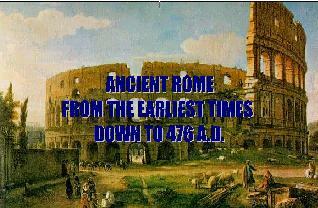 And the cooking of Ancient Rome was very similar to this cooking.
. My page Medieval/ Renaissance Italian Cookbooks. This is Agatha Christie's very first book, from 1920, and her first story featuring her famous Belgian private detective Hercule Poirot. This book is out of copyright and available as simple text from Project Gutenberg. I've edited the errors from the simple text, formatted it for easy reading, applied page numbering, generated a Table of Contents, created a title page, and made the printable PDF version. You can read the e-book with the Adobe Reader or print the e-book out on your PC's printer, if you prefer to read ink on paper. The book is 177 pages long. I've collected together two short mystery stories each from four famous writers of short mystery fiction, all available from Project Gutenberg as simple text. I've edited it, formatted it, put page numbers, title page and Table of Contents, and made the PDF version. I also provide introductions to each author and their respective stories. Two stories from The Amateur Cracksman by E. W. Hornung, published in 1899, featuring his famous gentleman-thief Mr. A. J. Raffles. Two stories from The Case Book of Sherlock Holmes, published in 1927, by Arthur Conan Doyle, featuring his famous amateur detective Mr. Sherlock Holmes. Two stories from The Innocence of Father Brown, published in 1911, by G. K. Chesterton, featuring his famous priest-detective Father Brown. Two stories from Lady Molly of Scotland Yard, published in 1910, by Baroness Orczy, featuring her famous female police detective Lady Molly. The book is 128 pages long. I have used Amazon.com's CreateSpace print-on-demand company to create a paperback version of this collection of short stories. It is priced at 7.99$ and is 182 pages long. CreateSpace's (an Amazon.com company) sales page for the book. If you use this code AHY2J7GU you get 2.00$ off the price of 7.99$ (so the book costs 5.99$). http://www.archive.org/details/texts The Internet Archive lets you search through 7 on-line text archives at once for books by author, title or subject or keywords. Once you find a book, you can often choose between various e-book formats including text files. You need to create a free account, but it is WELL worth it. http://gutenberg.net/index.html Project Gutenberg is the Internet's oldest producer of FREE electronic versions of books (e-texts) for download, and many you can read on-line. They have expanded their inventory to include e-books of varying formats, and much more content that can be read on-line in HTML format. This is a wonderful place for bibliophiles! http://gutenberg.net.au/ Project Gutenberg of Australia provides e-texts to read online in HTML format, and many, many e-books. They expanded into e-books recently, but their vast catalog is wonderful, so the e-books are wonderful. http://www.ebookdirectory.com/ The eBook Directory claims to be the biggest directory of free e-books on-line, and they certainly do have a large selection. They are ordered by category, but you can search on an author, title or subject keyword. The e-books are in various formats: PDF, LIT, EXE. http://www.free-ebooks.net/ Free eBooks.net offers thousands of free e-books ordered by category. You can search by author, title or subject. The e-books are in various formats. The subjects available are varied but if you are interested in business and self-help you will find a wide selection. There is even a category for fan-fiction. This site also issues an informative free newsletter, eBooks 'N Bytes, that regularly offers to-purchase e-books as prizes. http://esspc-ebooks.com/default.htm Mr. Ken Mattern has a site that offers nearly 450 free e-books formatted for the Microsoft Reader (LIT format). The books are mainly classics in various genre, but there are also modern works, too. Once you have the Microsoft Reader installed, you just need to access one of his books and it downloads automatically to your PC. Donations are accepted to keep the service up and running. http://etext.lib.virginia.edu/ebooks/ebooklist.html The University of Virginia's E-book Library lets you search by author for a text that is then free to download as an e-book for the MS Reader and the Palm Reader, and as an HTML text that you read in your Internet Browser window. http://www.munseys.com/ This site offers a wide range of free e-books. Scroll down their main page to check out their category list. http://www.cwru.edu/UL/preserve/general.htm Case Western Reserve University has digitized books into PDFs from their regular circulating collection that have become too fragile or brittle to allow normal circulation. The pages are actually scanned images of the actual book pages. I can't get this link to work all the time, sorry. You'll just have to trust me that it is a great resource! http://www.fullbooks.com/ Full Books is an unusual site that offers classic books to read on-line. It is unusual because the main page is just a listing of alphabetical groupings. Click on one, and you are shown all their books that fall within that grouping. Select a book, and you can read it on-line, after scrolling past a few ads. http://books.mirror.org/gb.home.html The Great Book Index offers many of the same classic texts to read on-line, minus the ads. http://www.bibliomania.com/bibliomania-static/index.html Bibliomania Study Guides offers over 2000 classic school texts to read on-line, along with study guides for each of the texts. http://vos.ucsb.edu/ Voice of the Shuttle from the University of California at Santa Barbara provides links to texts to download, and to other resources in the Humanities. http://www.ipl.org/ The Internet Public Library lets you search and link to sites with information on all kinds of subjects, and free e-texts. http://www.icdlbooks.org/ The International Children's Digital Library is a new site that scans actual children's books, in various languages, and lets you read them on-line, and enjoy the illustrations, as well. http://www.jewishvirtuallibrary.org/index.html The Jewish Virtual Library provides on-line texts on a variety of subjects to do with the Jewish culture and religion. http://www1.canadiana.org/en/home Early Canadiana Online offers over 10,000 texts to read on-line, all having to do with early Canadian history. You can search by lines of text or browsing through the titles. http://classics.mit.edu/index.html The Internet Classics Archive, set up by M.I.T., links to hundreds of classic texts from both Western and Eastern cultures. http://etext.library.adelaide.edu.au/aut/chrono.html The University of Adelaide's Library offers literature and historical works for download as e-text files, and to read on-line. http://eserver.org/ The E-Server at Iowa State University offers links to sites and texts in a wide range of academic subjects. http://andromeda.rutgers.edu/~jlynch/Lit/ Literary Resources on the Net, from Rutgers University, provides links to on-line texts and sites divided by historical period and by topic. http://www.english.upenn.edu/~traister/literature.html This site is from the University of Pennsylvania and offers a comprehensive list of links to literature sites on the Internet with many on-line texts. http://www.blupete.com/index.htm The Blupete page, setup by Canadian Lawyer Peter Landry, offers on-line texts on a variety of subjects including biographies, history, economics and the law. http://www.bartleby.com/ Bartleby.com, in their own words, is 'a pre-eminent Internet publisher of literature, reference and verse providing students, researchers and the intellectually curious with unlimited access to books and information on the web, free of charge'. They let you search for free on-line texts from encyclopedia, poetry, fiction and non-fiction collections. Enter keywords in the Smashwords search bar, followed by a comma (for example: mystery, ancient rome, fiction,) to locate the books that interest you. The books are available in various e-book formats for immediate download. And there are over 30,000 free e-books!